When last we left you, the crew of Lois McClure was steaming home, anxious to return to our families. We were finally back on beautiful Lake Champlain, through the narrows of the South Lake, dropping anchor at Fort Ticonderoga before the final leg that would bring us back to the museum’s North Harbor. The lake at this time of year is so spectacular with color and is largely quiet; the final leg was both contemplative and exciting as we reflected on our accomplishments, and looked forward to reunion with family and home. 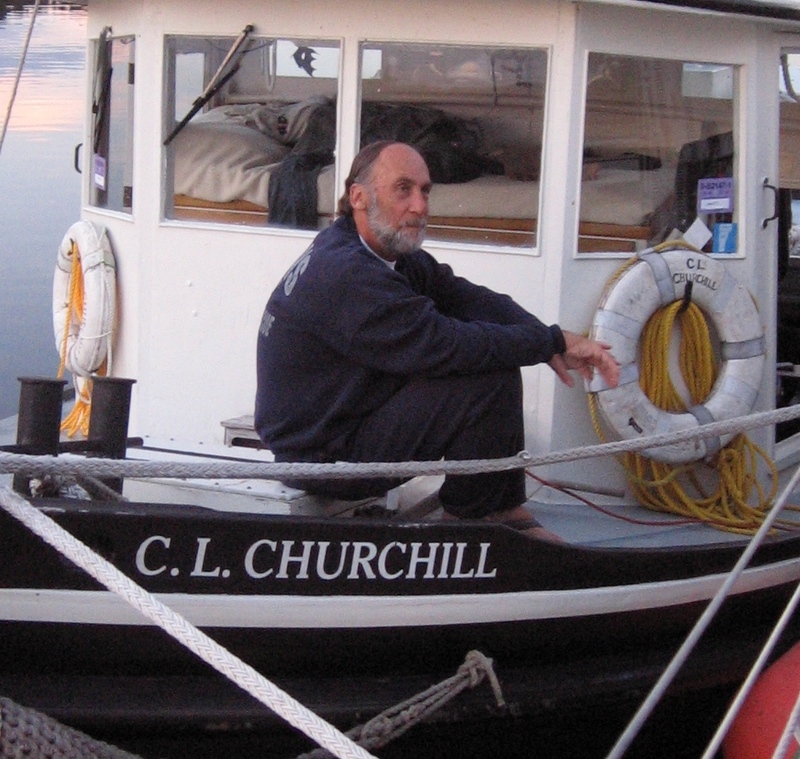 I particularly enjoyed these last runs with Church Hindes as my mate aboard the C.L.Churchill and the opportunity for conversation about a wide variety of subjects. Upon our arrival I think it is fair to say that although we were not rats deserting a sinking ship, the crew quickly scurried with their packs, duffle bags and sleeping materials to their respective rides home. Homecoming is such a special event and we all seemed to be caught up with the transition from boat adventure to our loved ones and dry land. I know I for one could not wait to get home. But we have by no means been relaxing! 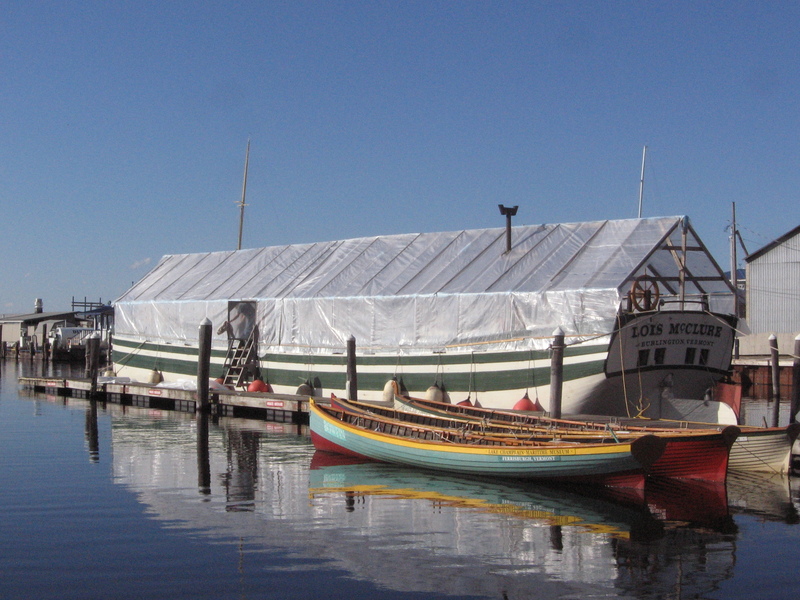 In the weeks that have followed we have moved the schooner back to her winter berth at Perkins Pier, taken the rig off and put her winter cover on. Ship’s Carpenter Kerry Batdorf has begun a series of repairs, the typical wooden boat issues around rot and damage. 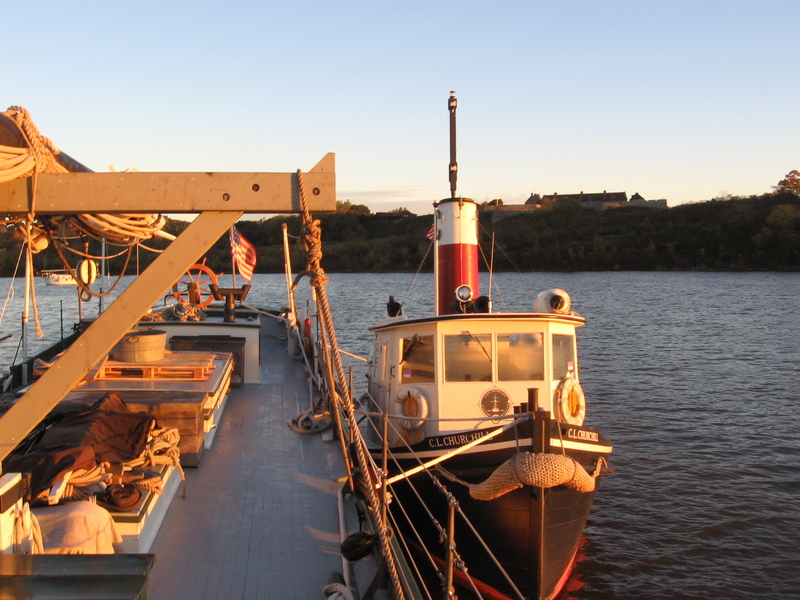 The Churchill has been moved to its winter quarters at the Shelburne Shipyard where Mary Griswold and crew continue to support our efforts by providing hauling, storage and launching as an annual contribution. The wonderful folks at Lake Champlain Transportation used their crane to remove our sailing rig, which is stored in the same shed where the Lois McClure was built. It really is fair to say that we could not do this operation without the extraordinary support we continue to receive from the community. As I reflect on these past three months and look forward to the busy winter ahead, I continue to be convinced that the traveling Lois McClure is one of the most special programs that we have been privileged to develop. The five years of tours have directly engaged thousands of people in the history and archaeology of our region. I am hopeful that a new publication entitled Lois McClure: The First Five Years, a compilation of images and logs from our journeys to New York City, Buffalo and Quebec, will be published in the coming months. Lois and Mac McClure and their family have helped us create a time machine for engaging the young, the old, the history-minded, the jaded, the digital generation, canal lovers, anyone and everyone, in this extraordinary story. I never cease to be amazed at how a visitor walking up our ramps steps aboard and is immediately embraced in historical connections, and wants to know more. What a privilege, what a treat. I thank the crew, our wonderful sponsors and you the reader, all of whom share an interest in the ongoing saga. Although Lois McClure is snug in her winter berth, these logs will continue all winter, bringing you up-to-date on our youth boatbuilding programs, nautical archaeology research, the Conservation Laboratory projects, and new programs and exhibit developments. Stay tuned!